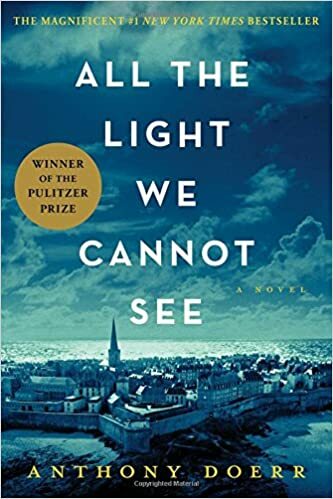 I got a bit out of the reading habit for a second there, but I’m back with it now and I just finished reading All the Light We Cannot See by Anthony Doerr and it was a beautiful book. It took the spot of a book with a blue cover on my book bingo. The Amazon blurb for this book says: Marie-Laure lives with her father in Paris near the Museum of Natural History, where he works as the master of its thousands of locks. When she is six, Marie-Laure goes blind and her father builds a perfect miniature of their neighborhood so she can memorize it by touch and navigate her way home. When she is twelve, the Nazis occupy Paris and father and daughter flee to the walled citadel of Saint-Malo, where Marie-Laure’s reclusive great-uncle lives in a tall house by the sea. With them they carry what might be the museum’s most valuable and dangerous jewel. This book really transported me back to the 1940s and I loved reading it. The characters seemed so real and the way Marie-Laure and Werner’s stories eventually intertwined was so simple and beautiful and the ending had me a bit misty-eyed, not gunna lie. There was a bit of mystery, a bit of sadness (ok more than a bit… it was during the war after all), a lot of hope and bravery, and I got very attached to this story. I read this one slowly, and I’m kind of glad that I did, because that meant I got to enjoy it even more. I know this book is already very popular, so if you’ve read it too, what did you think? Any other similar books you’d recommend for me to read next? I’d love some suggestions!